Mass producing jewellery with gemstones usually involves a standard design and gems calibrated to size. This remake highlights what can happen when the seeting is too small and the calibration on the gems is a little off. With repeat production of the same design a master is usually produced of the piece of jewellery and then a mould taken of it. From the mould replicas are produced using the method described in this recent post. The moulding and production process both cause the resulting pieces to shrink in size slightly from the master. If this shrinkage is not allowed for then problems can occur as the setting becomes too small for the intended calibrated gem size. This problem usually occurs when rather than making a master pattern, moulds are taken of pieces created from moulds. You get double shrinkage. Gems that are cut to standard sizes are referred to as calibrated. Whist modern cutting methods produce increased accuracy sizes do still vary. 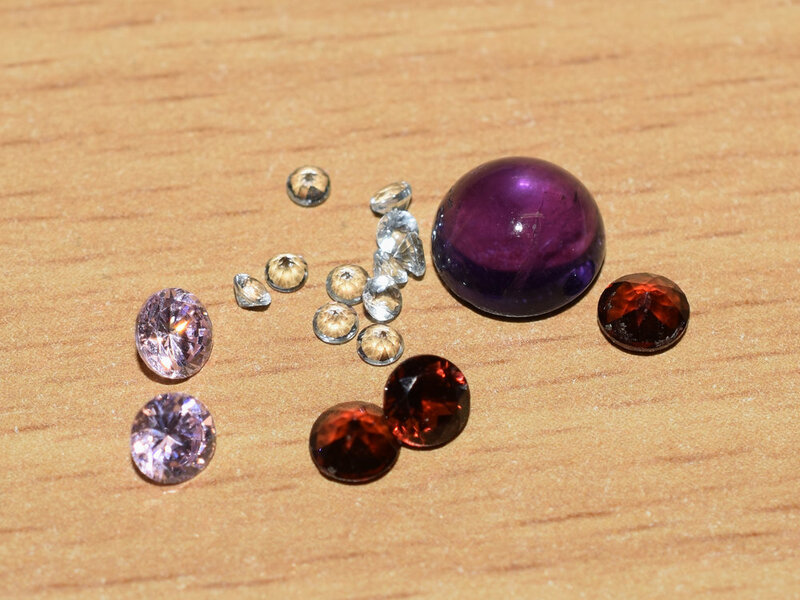 In the case of semi precious gems such as Amethyst, Peridot and some Garnets for example calibration is given higher priority over maximum size of the gem in order to allow the gems to be set into cheaper standard mass produced settings. However in the case of precious gems such as diamonds where the most is desired out of every piece of rough, calibration is not a priority, gem size is. This can become a problem when "jewellery resellers" who only have access to pieces of jewellery optimised for calibrated gems try to have set non calibrated gems of varying degrees into them to save on cost. This happens a lot in the jewellery "industry"....sadly especially with diamonds. Squeeze it in and get it sold. This ring was definitely created from a mould and it has two issues with it. When the ring was originally made the setting was slightly too small for the gem, probably because of the reasons we just discussed. In order to fit the gem into the ring metal was removed from the inside of the claws. This resulted in thinner claws that wore away quicker than they should resulting in the gem falling out. Despite these facts that shortened the life of the ring it did have a good life and was very sentimental to the owner. 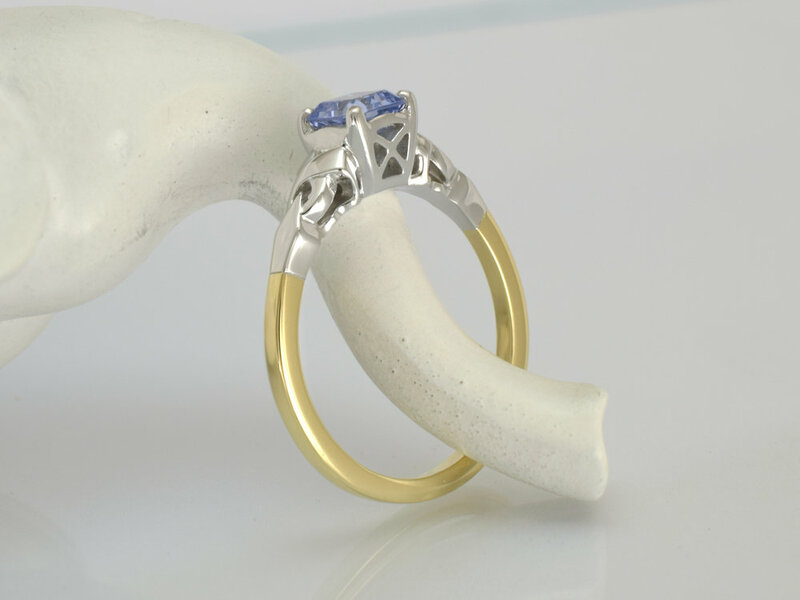 I was asked to take the gems and gold and restore the ring so that it could be passed down to the next generation. The second issue was that the setting needed to be remade slightly larger to fit the gem correctly. The same design but a bit larger and hopefully a bit neater. The seting would be remade slightly larger to fit the gem properly. 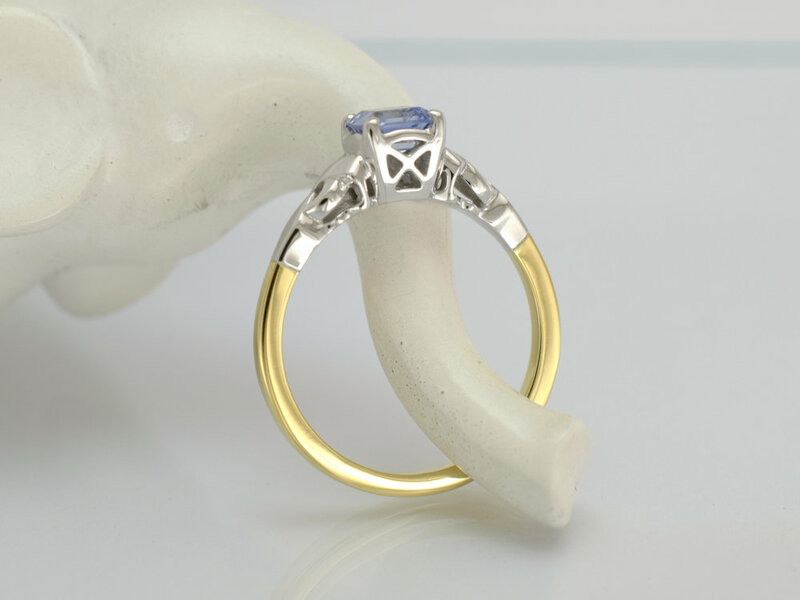 You can see from the photos the top appearance of the ring is the same but it has added thickness to the band giving it strength and a longer life. The weight of the ring went from 1.7 grams to 3.4 grams with the restored. The overall size of the setting is slightly bigger but the shoulder design and details I believe are true to the original design. The main gemstone is an Aquamarine and the ring was 18ct yellow and Palladium white gold. Carry the Flag competition winner.